1997- 1998: researcher in the production of membranes for the guided regeneration of soft and hard tissues within a project of University of Pisa. 1998- 1999: carried out research activity for post-PhD grant in Industrial Engineering. In 1999: received a working grant from the Faculty of Engineering at Pisa University. December 2001: won a post as researcher at the National Research Council. Up to 2014: Researcher of the Institute for Polymers, Composite and Biomaterials IPCB uos Pisa (ex IMCB). 2016: Researcher of uos Pisa of Institute for Chemical and Physical Processes IPCF c/o Department of Industrial and Civil Engineering. During the research activity period , she has applied her experience in the field of biomaterials mostly to the fields of material science, tissue engineering, drug delivery and nanotechnology. The activities have been carried out during diverse European and Ministerial Projects (MIUR, Regional, EU FP7), for some projects she has been involved as Principal Investigators. She has provided guidance for numerous graduate (86) and PhD theses for the students of Chemical Engineering, Industrial Chemistry and Biomedical Engineering. 2002-2012: Professor for a course entitled “Biomolecular and Cellular Engineering” for the Master in Biomedical Engineering at University of Pisa. 2011 to present: Professor for a course of Chemistry and Applied Chemistry for the Degree in Engineering of Energy. President of the Italian Biomaterial Congress SIB 2008. Invited to act as speaker and as chairman at numerous national and international congresses. 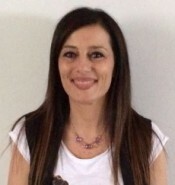 Member and secretary of Executive Committee of Italian Biomaterial Society (SIB). Member of Advisory Board of Journal of Applied Biomaterials & Functional Materials. At present, she is author of 118 scientific publications published both in national and international journals, 120 communications at national and international conferences and 3 patents. February 1995: came first in the entrance examination for the PhD Course in Biomaterials at Pisa University. November 1997-Nov 1998: researcher in the production of membranes for the guided regeneration, project between University of Pisa and PASTIS S.p.A.
f) Study of in vitro toxicity for the evaluation of impact and safety of nanomaterials on human health in accordance to upcoming regulatory issues. Dynamic Light Scattering, HPLC and gel permeation (UV detectors, RI, fluorimeter), Spotlight-Spectrum-one, Chemical Imaging FT-IR, SEM, laboratory cell cultures, DSC, TGA, laboratory for chemical synthesis, DMA, Rheometer, Extrusion equipment, hydraulic and solute permeability apparatus. Development of intelligent polymeric nanosystems for drug targeting.